The 2014 growing season was warm yet moderate—steady and very manageable from a viticultural standpoint. 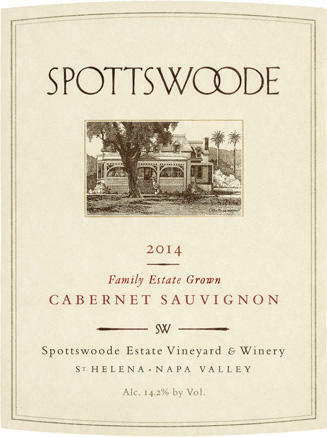 After a fairly dry winter, Mother Nature provided some much-needed rain early in the season, with our Spottswoode Estate Vineyard receiving a total of 17½ inches. This well-timed precipitation supported the growth of strong, vigorous vines, and we worked to bring fruit loads and vegetation into balance using natural cultivation practices, organic cover crops, and canopy adjustments. Aged 20 months in French oak barrels (new 60%). Harvest came early, and our new destemmer, vibrating shaker table, and four-camera optical sorting system allowed us to keep pace with the harvest and ensured only the most pristine fruit was used in the winery. The wines of 2014 developed beautifully in the fermenter, showing impeccable balance, excellent weight and density, and lovely overall harmony. This is a beautiful vintage that is neither heavy nor lacking, ripe but not overripe, warm and enticing, and layered and dynamic with nuance and character. Plenty of ripe blue and red fruit accompanied by notes of mocha, carob, butterscotch, and toast. Hints of dried herb and rose petal. Long, clean, and fresh, its strong acid backbone is a hallmark of what will be another long-lived, collectible wine. Discernable tannins that are youthful yet lengthy complement the underlying intense fruit. Dense and focused with primary, bright, youthful, fresh characters.